When the Fidesz-led Hungarian government installed Pál Schmitt in the presidential office, many mourned the end of the presidency as an active check-and-balance in the political system. There is no doubt that Schmitt’s successor, János Áder, is as much convinced of the government’s policies as Viktor Órban himself. Nevertheless, he has recently discovered the possibilities of his office giving hope that the Hungarian presidency might once again become independent of parliament and government. Until the election of Pál Schmitt, presidential activism in Hungary had more or less been an ever-increasing feature of the political system. After two years of struggle about executive authority between inaugural president Árpad Göncz and the government of József Antall, the president only used his powers sparsely over the rest of his term which ended in 2000. Göncz’ successor then used his powers more often, yet still moderately. With the election of former Constitutional Court chairman Lászlo Solyom, the use of presidential powers reached new heights. A crucial factor for the activism of all presidents had been cohabitation between president and government, thus it was expected that Schmitt would not become a particularly active president. Nevertheless, every president before him also vetoed during times of good (or at least fairly neutral) relations with the government. After Pál Schmitt’s plagiarism-induced resignation, János Áder promised to be a more active president than his party colleague and that he would check government bills more thoroughly. In fact he was quoted saying that if parliament passed a hundred good bills he would all sign them into law but if parliament passed a hundred bad bills he would use his veto against all of them. I was conducting research interviews Hungary at the time of Áder’s election and could ask several politicians and experts what they expected from Áder as president. Many were positively surprised by Áder’s speeches on the occasion of his election and his inauguration. However, almost as many remained sceptical not so much of the president’s ability but rather the president’s will to stand up against the president. A former fellow student and long-time friend of prime minister Viktor Orban, Áder was one of the first members of Fidesz (not a co-founder) and since then one of its most prominent representatives. From 1998 to 2002 he had been speaker of parliament and from 2002 to 2006 chairman of the Fidesz parliamentary party. This prominent position certainly gives Áder more freedom towards the party than backbench politician Pál Schmitt ever enjoyed. On the other hand, it is also evidence of Áder’s closeness to the party’s goals and ideology. 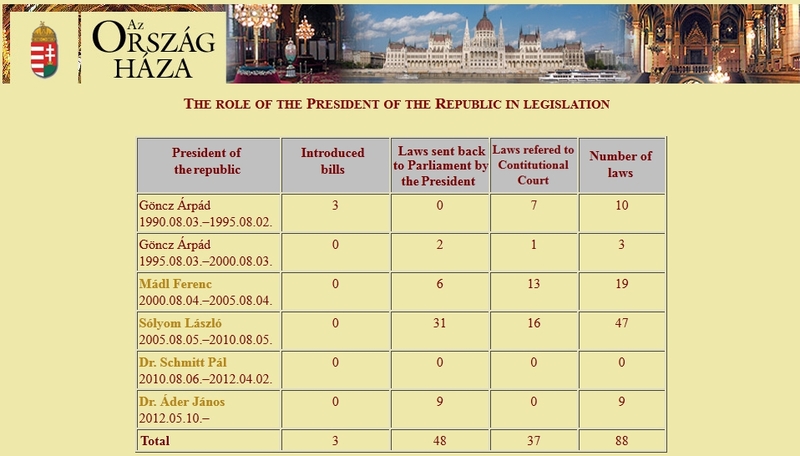 A more active and – in terms of legislation – more thorough president could thus have only been expected after the next parliamentary elections in 2014 (given that Fidesz would lose them, as current opinion polls suggest). The more surprising is it, that since his inauguration on 10 May 2012 Áder has referred a total of nine bills back to parliament (four of which within one month of his inauguration). The president generally declared that formal and procedural errors were the reason for his vetoes, but in the case of the bill regulating ownership of sports facilities a spokesperson made clear that the bill was simply badly crafted and so inconsistent that it needed to be completely reappraised. While the minister of justice officially welcomed Áder’s decision and the prime minister’s office blamed its own current reorganisation for errors in coordination for the vetoes, this cannot hide the fact that Áder has tasted blood and is exploring the possibilities of his office. His position towards the government and the parliamentary majority is further strengthened as opposition parties also find at least some positive appreciation for the president’s move. Furthermore, Áder is currently the most popular Hungarian politician – although his current approval rating of around 38-40 per cent falls short of ratings achieved by his predecessors (except for Pál Schmitt, of course). The vetoed bills were not of elementary importance for Fidesz’ policy agenda (the most controversial bills – such as the media law – were passed during Schmitt’s presidency anyway). However, each of the bills that have been reconsidered by parliament (currently seven out of nine) was passed in a new version which incorporated the president’s objections. Thus, while recent political developments in Hungary are certainly worrisome, there is at least some hope that the Hungarian presidency is now back at work and might – even during the remaining two years of Fidesz in government – evolve into a moderately effective check-and-balance on the government once again. I’m not sure where you got this from. According to all major Hungarian opinion polls Fidesz would still win the next election, although not with a 2/3 majority. It is true that their lead is getting smaller and smaller, but I think the main problem is that there is no real alternative to vote for at the moment. We shall see what happens with Bajnai’s Egyutt 2014 initiative. Thanks for your comment! I agree with you about the current lack of an alternative to Fidesz. 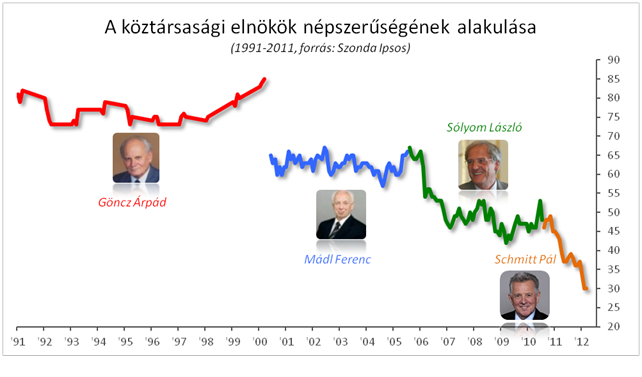 However, since the beginning of 2011, Fidesz’ approval ratings have been in decline (http://www.portfolio.hu/gazdasag/helybol_ugrottak_bajnaiek.175336.html). Athough they would still win 38%, I believe an electoral alliance of MSZP, LMP and Egyutt 2014 could have a chance (especially if the economic situation worsens). Admittedly, there is still a lot of coordination and reconciliation to be done here and what I wrote in the article might thus be exaggerating the trend. Yes, I agree with that, but there are still quite a lot of hoops to jump through before there is an MSZP, LMP, Egyutt 2014 alliance. The terms are not exactly worked out as of yet and MSZP and LMP are not exactly on great terms, but that could change. What I’m more worried about is the voter registration that is currently being implemented.